Serena Williams, Nicky Minaj and Nas co-star in a new Beats by Dre commercial. “In fair Queens a conflict sits. Between two side our heroes split,” Nasir says at the beginning of the spot, referring to the dilemma that surrounds Serena’s career. Nicky Minaj’s single “Majesty”, featuring Eminem, serves as soundtrack. Dressed in a couture dress, the tennis champion is also featured in the middle of a city street, being crowned the “Queen of Queens”. Finally, Minaj is heard rapping her famed verse on Kanye West’s “Monster” – “Now watch the Queen conquer”. 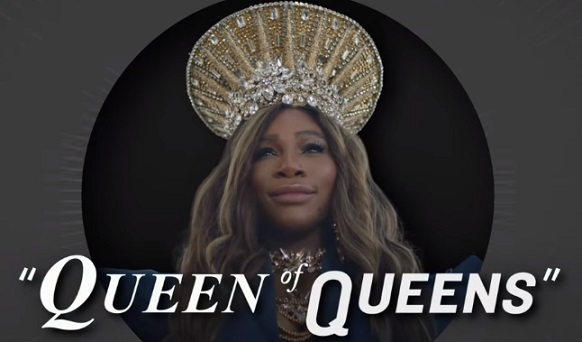 Serena Williams, who made her tennis comeback six months after giving birth to her daughter, Alexis Olympia, and defeated Magda Linette to the US Open on Monday, opening her bid for a record-tying 24th grand slam title, starred in several ads this year. A recent Nike ad, labelled by Sports Illustrated as “one of the best sports ads in recent memory”, pays tribute to her career by featuring home video of her as a child on a local court, in 1991, together with her father, Richard, mixed with footage of her competing at various US Opens as a professional. The voiceover is provided by her father, who is heard teaching, congratulating and encouraging her. A Gatorade ad, featuring Serena Williams training for her 2018 Wimbledon final and voiced by her mother, says Serena “Plays Like a Mother” and celebrates her determination to fight back to the top of women’s tennis months after giving birth. “Majesty”, included on Minaj’s recently released album, “Queen”, was performed by the rapper at the Video Music Awards 2018.